I am a Literary Festival Addict! Being a proud Scot, the Edinburgh Book Festival is for me the jewel in the crown – 720 authors in Scotland’s great capital, what’s not to like? What though is my main memory of the many Edinburgh festivals I have attended? The queues, the (expletive deleted) queues. Then there is, of course, the rain (it is Scotland in the summer!). And the stress of having to rush between tents to see the next author – a first-world problem of the first order. Recently my interest in book festivals has changed. I am now not merely a punter but I am also a participant. Of course my concerns are different. Now the question is will anybody turn up? Will I have to help to move the furniture? Will I knock over the glass and spill the water on my notes? The biggest stress is however about whether the technology will work. Powerpoint – I can’t be the only person who wishes Bill Gates and his mates had never created it? Then there is the potential for feedback from the sound system and there always seems to be a distressed deaf person in attendance. There is also the chair-person to contend with. Will he or she forget his notes and introduce somebody else (it does happen!)? How much time will he/she allow for questions (always too much time in my experience)? Will the person you have planted in the audience to lob an easy question go rogue and ask the question you wanted to avoid (thanks Anita!)? Will a person who knows more about the subject than you turn up? This year my perspective has changed again. 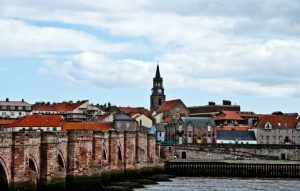 Now I am on the other side as a programme co-ordinator for the Berwick upon Tweed Literary Festival no less. This will be the fourth year of the festival and last year was the most successful yet. This seems an easy job. Writers are needy people wanting attention aren’t they? That is the stereotype but if it were true why do we sometimes wait weeks for a reply that often never comes? The very needy ones in fact tend to contact you unsolicited again and again and again… Then when you have replies that you want you have to timetable them and then you find of course that everybody wants that great time and place. It is certainly not easy to keep everybody happy. It has had its funny moments, for example there was the writer who we thought would be great who it turns out is dead! Soon we will wonder whether anybody will come. Berwickers notoriously leave it late to book so the tension will continue until October 19thth. Surely many will come from elsewhere? Berwick is an attractive place as everybody who passes on the train says. But most of them don’t get off! If despite the above you wish to help, for example as a Blogger or a Volunteer over the weekend, then e-mail me at mikefraser36@gmail.com . Hopefully I will have some hair left by 23rd October! Our 2017 Festival – Something for Everybody!